Bush Getaways: This privately owned game farm in the Klein Winterhoek Mountains, of the malaria free Sundays River Valley, offers three unique bush getaway experiences. We are situated only 95 km from Port Elizabeth. The farm is home to over 25 species of game. Scenic bush walks, mountain bike trails and 4×4 routes are all on offer. Nearby, one can visit the Addo Elephant National Park, the Daniell Cheetah Breeding Farm, citrus packhouses or top class health spas. 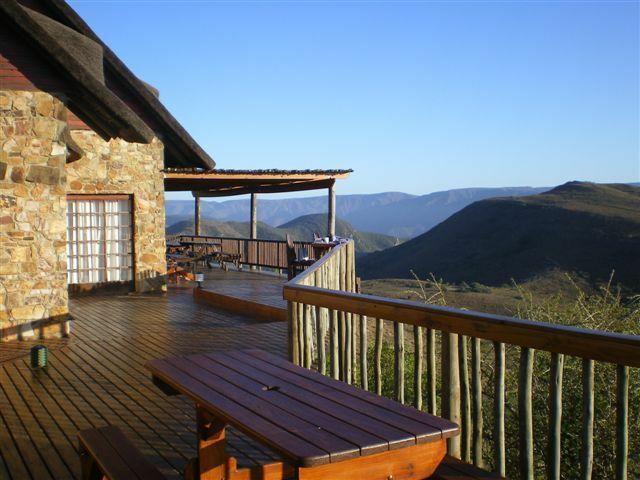 Intaba Lodge is a luxury 4 Star Graded mountaintop lodge, which is only accessible by a 4×4 vehicle. Panoramic, wraparound views of the Greater Addo Park, Zuurberg and Cockscomb Mountains, stunning sunsets and abundant game viewing make the lodge a desirable option. It sleeps up to 14 guests comfortably and is fully-equipped for self-catering, with webers, potjies, DStv and an entertainment system. Aloe Tented Camp is 3 Star Graded and offers accommodation with a difference. This child friendly camp sleeps up to 28 guests comfortably in three safari tents and a thatched chalet, each with its own bathroom close by. The lapa has an open-plan kitchen, barbecue and pub area, and is fully-equipped for self-catering. The natural rock pool and barbecue areas are a feature nestled into the surrounding bush. Deer Cottage is a 3 Star Graded, quaint renovated three bedroom farm cottage dating back to 1890 and is home to resident Axis deer and springbuck. Steeped in the history of the past Anglo-Boer conflicts, it is now a tranquil getaway for flora and fauna enthusiasts. It sleeps up to 10 guests and is comfortably furnished and fully-equipped for self-catering. The Aloe tented camp and Deer Cottage are easily accessible by normal car. This is a one-stop destination for family getaways, corporate indabas, school bundu bashing breakaways and nature lovers. Juliet Botha, South Africa: A low tented camp is a wonderful piece of bush heaven. We thoroughly enjoyed our stay! Thank you for a great venue.